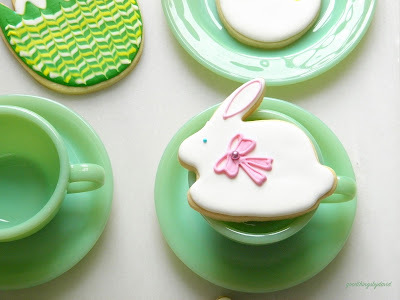 It isn't quite Easter at my house until I've iced a few sugar cookies and have brought out my vintage Fire King jadeite. 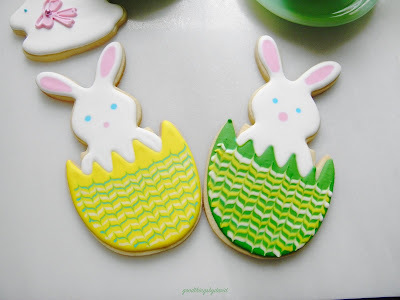 With spring in the air and the promises of sunny weather, it's the perfect time to initiate an Easter egg hunt, and to make a few Easter baskets for the kids this holiday. I love Easter to no end. 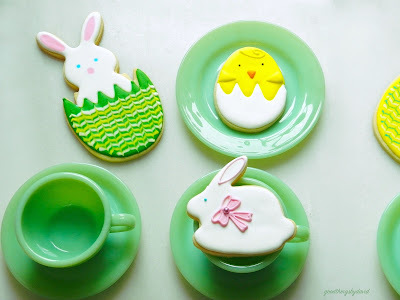 The pastel colors, the dyed eggs and the endless sweets, bring back good memories from childhood. Who doesn't remember getting those Paas dye kits from the local Kmart or F.W. Woolworth store? Mom would usually set out bowls to hold the dyes, and us kids would carefully dunk each egg into the smelly solution, turning them around with the little wire holder that came with each kit. Good times! 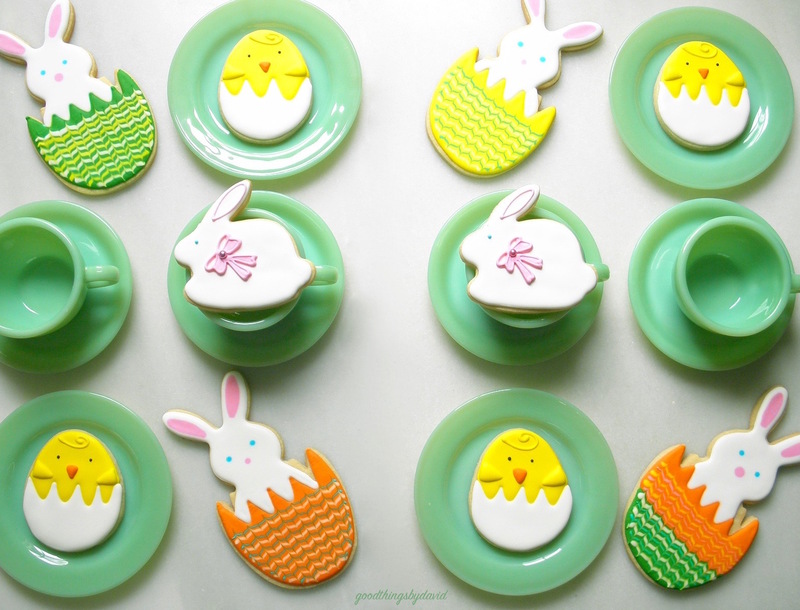 As I said, Easter just wouldn't be the same without my sugar cookies. For family and friends, near and far, I baked and iced some whimsical hatching chicks and some hatching bunnies. A few small, blue-eyed bunnies decorated with colorful bows, rounded out the selection for this year's Easter baskets. Take a look at how they were made! 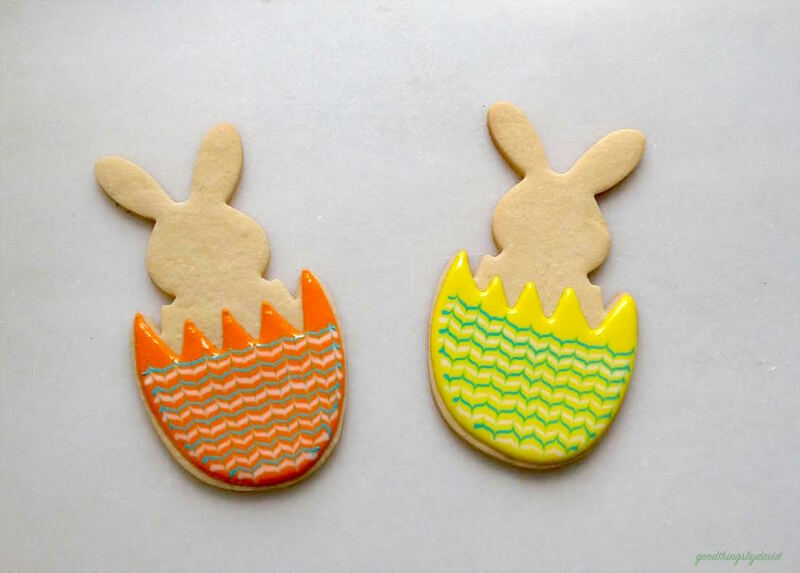 Note: the cookies shown here were cut out with an egg cookie cutter, a bunny cookie cutter and a hatching bunny cookie cutter. Royal icings in white, orange, yellow, pink, green, black and sky blue were used to decorate them, along with large 6 mm French drageés. For the bunnies, I outlined and flooded each body in white royal icing. The bases were left to dry completely. Pink icing and a very fine, #1 piping tip, were used to delineate an ear, and to outline a large bow. I then filled in the areas of the bows, as shown, and while wet, I carefully placed a very large drageé in the middle. The cookie was then left to dry. 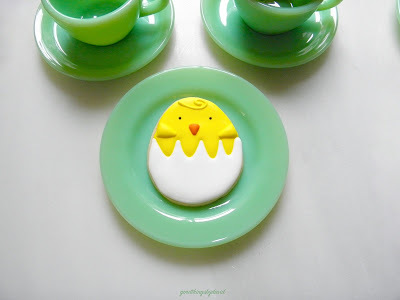 For the hatching chicks, outline and flood the cracked egg in white royal icing, as shown, using a #3 piping tip. 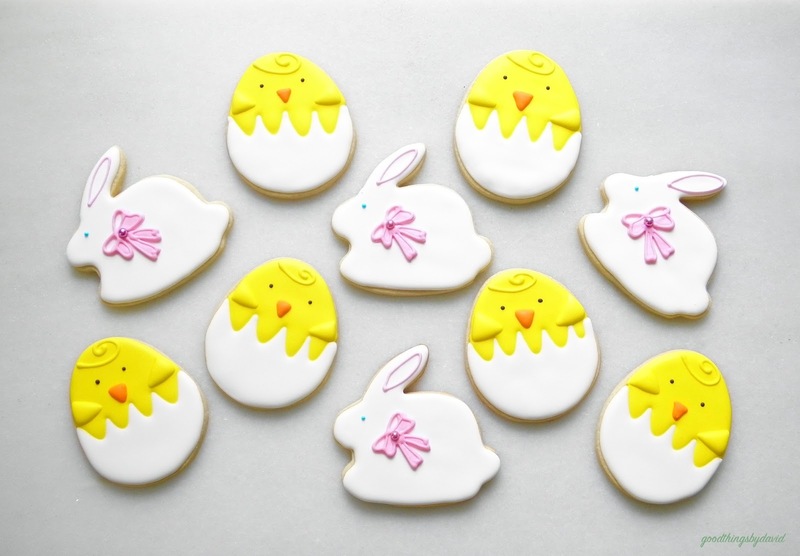 Immediately, outline and flood the chick's body in a bright-yellow royal icing, using a #3 piping tip. Let the bases dry completely. With a #1 piping tip, and the same yellow royal icing, add a whimsical curlicue at the top of the chick's head, and outline and flood two little wings, as shown. Using a #1 piping tip and an orange royal icing, outline and flood a small beak as shown. Let this dry completely. Last, but not least, add two small black dots for eyes on the chicks. For the bunnies, add a small sky-blue dot for an eye, and outline the details of the bows using a very fine, #1 piping tip and the same pink royal icing. This hatching chick looks too adorable sitting on this Fire King, restaurant ware jadeite plate. It's ready to be gobbled up during tea time. For some special kids, I created these large bunnies hatching out of eggshells. This particular cookie cutter comes from Copper Gifts. Look for it because it will become a family heirloom cutter in your collection. 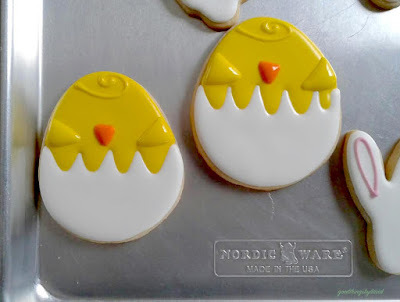 Outline and flood the cracked egg in either yellow or orange royal icing, and immediately pipe horizontal lines, in alternating colors, using a light blue and white royal icing and #2 piping tips. Immediately drag a cake decorating pick or toothpick through the icing to create the design. It's important to wipe the pick between each run so that you don't mar the icing. Let the eggs dry. 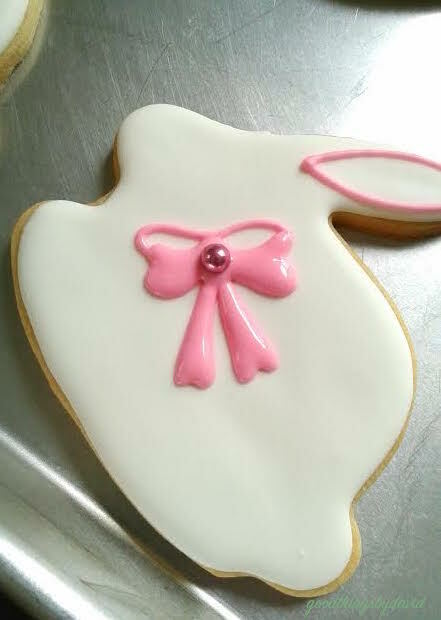 Outline and flood the bunny's body in white royal icing, and while wet, add pink ears, a pink nose and blue eyes. Let them dry completely before packaging the cookies. I love the bows on my bunnies. I think the little critters look extra-spiffy for Easter. This cookie was set atop a Fire King restaurant ware cup ready for a pouring of tea. Delicious! If you've used my heirloom sugar cookie recipe and my perfect royal icing recipe, then I can guarantee that these treats are going to be good. I like to test one or two just be sure, each and every time. I hope many of you have baked and iced sugar cookies of your very own this Easter. Package them in clear cellophane bags and tie each with a colorful ribbon. 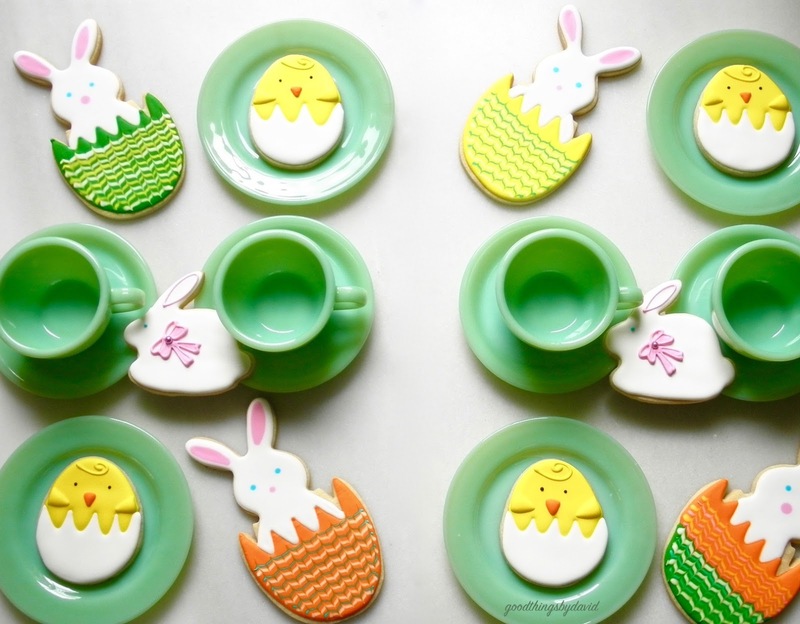 You can then carefully place cookies in Easter baskets, or atop platters for the brunch or dinner at your home. Make them tasty, make them colorful.